One Tuesday each month we have a gathering that we call “Power and Praise,” an evening where we come together to draw near to God with our praise and to experience His power as the Holy Spirit leads. 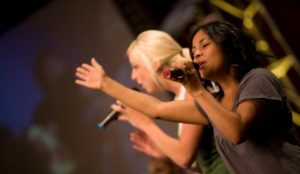 Starting at 7:30 pm, the night is full of praise music and time for ministry through prayer and the gifts of the Spirit. In recent months 200-300 people have been coming out, and the number just keeps growing. We have seen legs grow, backs healed, shoulders healed, chronic headaches lifted, and the list goes on. And this is just testimonies of healing! Many of the gifts of the Spirit have been in operation any given Power & Praise night.